One of the pitfalls inherent in being a cinephile is despairing the hours of formulaic dross one necessarily wades through. Every now and then, however, a gem shines brightly in the swamp - a film that reminds you what cinema is capable of. Such rare treasures are often uncomplicated, foregoing overindulgent narrative or visual elaborations, yet profound in the subtle and dexterous ways they nuance a story, capture an event, or stroke an emotion. A documentary about Formula One is perhaps not the most obvious place to find 106 minutes of engrossing filmmaking. 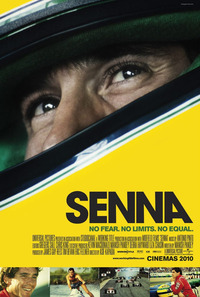 Yet Asif Kapadia’s Senna reaffirmed for me the affective and essential power that the cinema, at its best, can attain. Admittedly, I was already sold on the premise. Sunday afternoons in my teenage years were spent listening to the raw, hyper-enthused screech of Murray Walker commentating on names such as Lauda, Prost, Mansell and, of course, Ayrton Senna. Senna is regarded as the most talented, uncompromising, courageous and, for want of a better word, driven driver of his generation. As this documentary explores, his exalted status is due not only to a perfunctory measure of wins, but to the passion and audacity of his driving, the transcendence of his charisma and, ultimately, to a fascination with those who negotiate the border between genius and insanity. The narrative arc of the film takes a fairly standard historical approach, documenting Senna’s early career in karting, through his arrival into Formula One, and onto the world championship title itself. But it is the quality of the archive footage that gives the film its depth. Home movies nostalgically depict the “pure racing” of Senna’s youth along with the comfortable lifestyle and parental support that facilitated his career. Racing footage defines his victories and defeats primarily through an intense rivalry with arch nemesis Alain Prost. Some of the most interesting moments, however, emerge from the unseen driver briefings and FIA summits, which grant an insight into the murky political intrigue lurking behind Formula One’s glamorous façade. Senna, seemingly, was no politician. Much of the footage is truly mesmerising. The grainy images from shaky on-board cameras showing Senna pushing his car to - and often beyond - its limits create an intense, immersive experience when projected on the big screen. Truly shocking however, is the disgustingly visceral and mercilessly immediate ‘impact’ of watching the various high-speed accidents and their aftermaths. There were audible gasps in my cinema when Rubens Barrichello lost control of his car and hit the circuit barrier at 190mph. The triumph of the film lies in its editing. This documentary is structured entirely as a montage of archival images overlaid by voice-over narration from family, friends, team bosses, doctors, and the man himself. There is no cutting away to talking heads, and this serves to intensify the film’s pace, the relentlessness of which is ameliorated by Antonio Pinto’s urgent yet sombre soundtrack. Director Asif Kapadia has fashioned the visual raw material into something both dramatic and truly cinematic. At one point the film cuts between footage of Roland Ratzenberger’s crash and Senna watching on television from the pits. His deeply personal and emotional reaction here demonstrates the potency of the documentary form, but also exemplifies its ethical ambiguities. Does documentary construct drama (like any fictional film) rather than reflect the truth of a moment? And should we be watching? At the centre of the film is, of course, Senna himself, a contradictory and almost mythical figure. His descriptions of driving as a quasi-religious experience and his ascendance to both sporting icon and national hero are fascinating. Yet it is his emotional transparency, whether rapturous in victory or abject in failure, that radiates from the screen. As with all biopics, ambiguous questions are raised concerning how the image of the protagonist is being represented here. But the film works, finally, because it is simply a virtuoso piece of filmmaking. Whether or not you have ever heard the name Senna, if you love cinema this film is a must. This review was published on June 07, 2011.